Roger Federer Is Tough to Beat. Brett Kavanaugh May Have Pulled an Upset. Or was it the Net Neutrality repeal? The New York Times has found the answer to why Roger Federer lost in the fourth round at the U.S. Open to some Australian nobody: global warming. You see, it was hot on Monday night in New York City. Even Federer says so. He had "soaking wet pants, soaking wet everything." "It was just hot. No shame there," he said. "These things unfortunately sometimes happen." But you can't fool the Times. It wasn't just hot. It was climate change. "Under climate change, overall temperatures are rising — 2018 is on track to be the fourth-warmest year on record — but the warming is not happening evenly," the Times writes. "Short-term weather conditions are not the same as long-term changes to the climate, and a few hot days do not prove a trend. 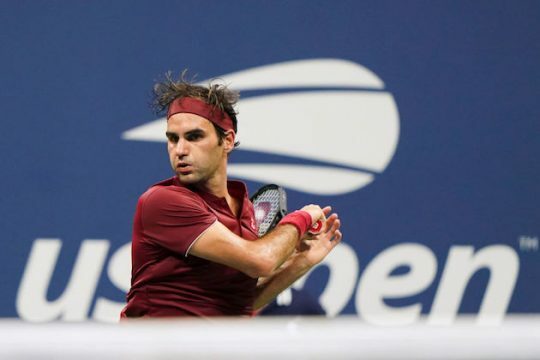 But the unusual heat and humidity that appeared to strain Federer are in keeping with the changes that atmospheric scientists are seeing under human-caused global warming." It's an interesting theory. But here are some other explanations the Times could make for Federer's upset. Federer played John Millman on the eve of Supreme Court nominee Brett Kavenaugh's Senate confirmation hearing. Is it a mere coincidence that Federer played so poorly just hours before the Senate would begin the process of putting the biggest threat to "women, workers, and the environment" on the highest court of the land, with Democrats helpless to stop it? I think not. Federer racked up 76 unforced errors, and lost in just four sets. That doesn't sound like the Federer we know, and the only possible explanation is he wanted out of Arthur Ashe Stadium so he could go back to his hotel to read Bob Woodward's new book. Federer admitted he was "just happy that the match was over." Probably so he could get in bed and read about President Trump wanting to take out a brutal dictator who gases his own people, and other juicy comments from the "Ernest Hemingway of 140 characters." The U.S. Open is only the second Grand Slam tournament Federer has played in since net neutrality was repealed on June 11. Federer was the number one seed at Wimbledon, but was upset by South Africa's Kevin Anderson in five sets. For context: the match took place on the one month anniversary of the "end of the Internet as we know it." Now he's been upset again. Facts are facts: Federer has not played well since the big wireless companies were able to sell unlimited data plans again.